The Heath Bros have published several books and I think I have read all of them. Made to Stick had great ideas for making things memorable in school and business. 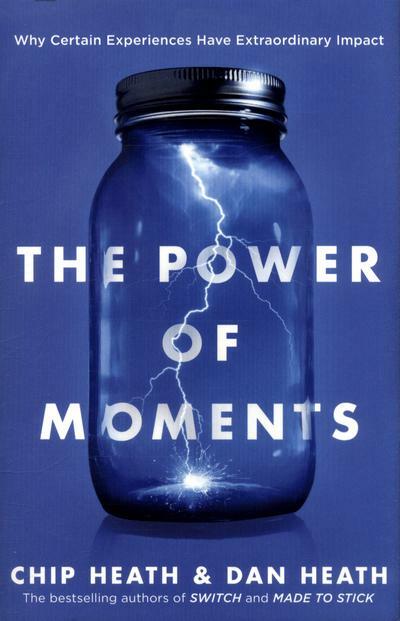 Switch focused on how emotions can take us off the path of rational thought, Decisive had great applications to decision-making and now the Power of Moments. One of the Heath Bros is a professor of business and the other a professor in education. In the beginning, here is the question that hooked me right away. How would you design a lesson that students would remember 25 years later? That stem could be used e.g. how would you design a workplace….., how would you design a product…., who would you create a legacy…..
We all have defining moments in our life. Graduations, marriage, the birth of a child, the death of our parents. Sometimes even deeper are the emotional markers. For me, the assassination of JFK, MLK, and RFK. The Challenger disaster, 911, etc. In life, there certainly will be the difficult events. How do we design positive memorable events? The first example was of the Magic Castle Hotel, in Los Angeles which is a converted apartment complex. They have created such a memorable service that people stay there even though the rooms, etc. are not the fanciest. They have a cherry-red phone near the pool area. When you pick it up a person answers, “Hello, Popsicle Hotline.” You place an order and within minutes, a hotel staff person, wearing white gloves delivers your cherry, orange, or grape Popsicles to you at poolside. On a silver tray. For free. What a service. Other goodies like candy bars can also be ordered for free. They do laundry for free. Sounds like a place I am going to check out in the near future. There are four basics for designing the defining moments. CONNECTION: Experiences are always better when others share in the moment. The social connection makes the experience stronger. Keep in mind that these four tenets can also be produced by traumatic moments like a house fire, or the emotional markers mentioned before. We must learn to think in moments, to spot the occasions that are worthy of investment. But for an individual human being, moments are the thing. Moments are what we remember and what we cherish. The next story is about the First Day Experience at John Deere. How we bring people into our organization says a great deal about making the right connections to the company and people. At John Deere the new employee has already received a welcoming letter, an email from a current employee introducing themselves and some of the basics about the company. Where to park, dress norms, etc. Someone is there to greet the new employee on the first day who will accompany them to their workspace. A banner will be displayed to identify you as a new person. Others will stop in, introduce themselves and welcome the new employee. The company is aware that transitions are hard. They focus on the big three; intellectual (new work), social (new people), and environmental (new place). So, what is the first-day experience like in your organization? I liked this definition – Pits are the opposite of peaks. They are negative defining moments— moments of hardship or pain or anxiety. Pits need to be filled. The question I am asking is what do we do when we run into a pit? How do we fix it? Who do we ask for help in fixing it? There are always problems that arise in life and business. Every great service company is a master of service recovery. The next story was about an industrial designer at GE. He designed a great technology for a machine like an MRI. After two years they started using it. Technologically it was superior. The problem was kids and adults didn’t like being in the machine. The designer was crushed to hear it looked like a brick with a hole in it. Back to the drawing board to make it user-friendly. How do we build peaks? Two teachers, who didn’t know each other very well, were good teachers but disillusioned. Both were considering giving up teaching. Research says it is not so much the overwhelming requirements that burn teachers out, it is the feeling they are not making a difference for kids. They started working together to design academic experiences that were memorable to themselves and for the kids. Fill pits, then build peaks. We all know this from living. “Bad Is Stronger than Good.” Researchers at the University of Pennsylvania summarized dozens of studies that pitted negative information against positive. To create fans, you need the remarkable, and that requires peaks. Peaks don’t emerge naturally. They must be built. To elevate a moment, do three things: First, boost sensory appeal. Second, raise the stakes. Third, break the script. To raise the stakes is to add an element of productive pressure: a competition, a game, a performance, a deadline, lie commitment. I really like this thought – Beware the soul-sucking force of “reasonableness.” You can deflate the effect by playing it too close to the vest. Ladies and gentlemen, if you wish to smoke, the smoking section on this airplane is on the wing and if you can light ’em, you can smoke ’em. To activate the flow of oxygen, pull down on the mask, place it over your nose and mouth, then insert one quarter for the first five minutes of oxygen and an additional dime every five minutes after. Exact change only, please! Put the oxygen mask on yourself first, then on a child. If you’re traveling with more than one child, start with the one who has more potential or who is less likely to put you in the home. Here is another gem from this book. “The secret to growing a business is to “reduce negative variance and increase positive variance.” To increase positive variance is to welcome humanity and spontaneity into the system. And that means giving employees license to break the script. We need this to deal with the increasing diversity in the world. As Edward O. Wilson said, “diversity strengths.” Embrace diversity to increase creativity and positive solutions. By breaking the script, we can lay down a richer set of memories. As the authors of the book Surprise put it, “We feel most comfortable when things are certain, but we feel most alive when they’re not. Mentors push, mentees stretch. David Scott Yeager and eight colleagues: high standards + assurance. Yeager described a study in a suburban junior high school in which 44 seventh-grade students were assigned to write an essay about a personal hero. Their teachers then marked up the essays, providing written feedback. About 40% of the students who got the generic note chose to revise their papers. But almost 80% of the wise criticism students revised their papers, and in editing their papers, they made more than twice as many corrections as the other students. But the wise criticism note carries a different sage. It says, I know you’re capable of great things if you’ll just put in the work. The marked-up essay is not a personal judgment. It’s a push to stretch. High standards + assurance is a powerful formula, it ultimately is just a statement of expectations. It requires the mentor to expose the mentee to risk. This is also a classic tension of parenting, of course: Should you give your kids the freedom to make mistakes, or should you shield them? Most parents tiptoe nervously along the line between under- and overprotectiveness. What equipped her to survive this gauntlet of failure? I grew immune to the word ‘no’ and even found my situation amusing.” That’s a powerful moment of insight. She realizes: I don’t fear failure anymore. It’s no longer an obstacle to me. How does this apply to your organization? Can you use this in mentoring others? By stretching, we create moments of self-insight, that wellspring of mental health and well-being. We will never know our reach unless we stretch. Pride Matters. A few minutes can change a life. These moments didn’t just happen; thoughtful teachers made them happen. What if every teacher received guidance about handling students who seem hurt and withdrawn? It could be included in new teacher training: Here’s what we know about how to make a lasting impact in a child’s life in a few precious minutes. Wiley sums up the research: “More than 80 percent of supervisors claim they frequently express appreciation to their subordinates, while less than 20 percent of the employees report that their supervisors express appreciation more than occasionally.” Call it the recognition gap. The employee of the Month awards or annual banquets recognize star performers. These programs are inadequate for two reasons. First, the scale is all wrong. When we talk about the need to recognize employees, we’re not aiming for one employee per month! The proper pace of recognition is weekly or even daily, not monthly or yearly. Second, the mulish formality of the program can breed cynicism. For example, every Employee of the Month program in human history has been plagued by a similar dynamic: If you judged the award fairly, your best employee would win the award every month, but it seems socially awkward to give it to Jenny every time, so you start concocting reasons to spread the award around, and after a year or two of hopscotching among employees, Stuart is the only guy on the team who hasn’t won, and it’s becoming An Issue, so one November you throw him a bone. Recognition experts have advice on how to escape this trap. Managers are saying, “I saw what you did, and I appreciate it. The style is not important. What’s important is authenticity: being personal, not programmatic. And frequency: closer to weekly than yearly. We are living in such a fast-paced world, I believe we don’t say thank you enough. Here is an exercise I do in workshops. I, Bill, called it Emotional Anorexia. Think of a person who helped you get where you are today. It could be a relative, teacher, advisor, etc. We all have these people in our life. When things weren’t going well, they helped us. The old adage, if you see a turtle on a post, you know it didn’t get there by itself. Once you have that person’s face answer this question. Have you, or how long has it been, since you said thank you. Then I make a request. Within one day, call, write, email that person and say thank you and tell them how grateful you are for their support. If they are deceased, write a letter. They will know. The second request, think of a second person who helped you. Within three days do the same. The third request, think of a third person and within one week, do the same. Brain researchers have found that the person receiving the message gets a dopamine hit when you tell them how they have meant to you. Researchers have also found that the person giving the recognition also gets a dopamine hit. So, you get a benefit too. Our theory: We’ve been brainwashed by the goals we see in our work lives. Executives tend to set goals that sound like this: Grow revenues to $20 billion by 2020! Similar goals cascade downward. A numerical goal plus supporting plans. Notice what that combination leaves us with: A destination that is not inherently motivating and that lacks meaningful milestones along the way. We should be careful that we don’t let this corporate style of goal-setting infiltrate our personal lives, where we’re in full control. to counteract the “command and control” culture to larger goals and plans? A wise leader can look for milestones en route to a larger goal. MILESTONE 1: Receive a glowing thank-you from a well-satisfied customer. MILESTONE 2: Make it a full week without any surveys scoring their satisfaction as a 1 out of 7. MILESTONE 3: Solve the number one complaint from the last month of surveys. MOMENTS OF CONNECTION – One consistent theme from the visits surprised them: You can’t deliver a great patient experience without first delivering a great employee experience. The landscaping crew had noticed that some patients didn’t receive visitors or flowers, so they started pruning roses, putting the blooms in a small bud vase, and walking them into the patients’ rooms. (They called the program “This buds for you.) Caregivers were trained to greet patients, introduce themselves, and explain their roles—solving the problem that had frustrated Rhodes during her father’s stay. At Sharp Coronado Hospital, departing patients received a loaf of banana bread, “baked with love.” Physician satisfaction rose to the 80th percentile. Employee satisfaction rose by 13% and turnover declined by 14%. Net revenue increased by a half-billion dollars. Moments of meaning matter. Hansen also explored the distinction between purpose and passion. Purpose is defined as the sense that you are contributing to others, that your work has a broader meaning. Passion is the feeling of excitement or enthusiasm you have about your work. Hansen was curious which would have a greater effect on job performance. I wish I’d had the courage to live a life true to myself. Not the life others expected of me. wish that I had let myself be happier.